You are cordially invited to join us, Thursday, March 28, 2019 at 7:00 P.M., Community Church of Vero Beach for the second Quarterly Public Meeting of the Clean Water Coalition of Indian River County. As you may recall, it was standing-room-only last time, so we have secured the larger and well-equipped Fellowship Hall thanks to the generosity of Community Church. We will welcome Dr. Duane DeFreese, Executive Director of the IRL/National Estuary Program (IRL-NEP) who will talk about the mission of IRLNEP to restore the Lagoon, and the crucial role of organizations like CWC that act as a bridge between Science, the Community, and our elected Representatives. This will be followed by a panel discussion of CWC’s Clean Water Initiatives and public comment. For more information on this event, please visit CWC’s website (click: here) or join them on Facebook (click: here). Thank you again for your continued support of the Clean Water Coalition of Indian River County. 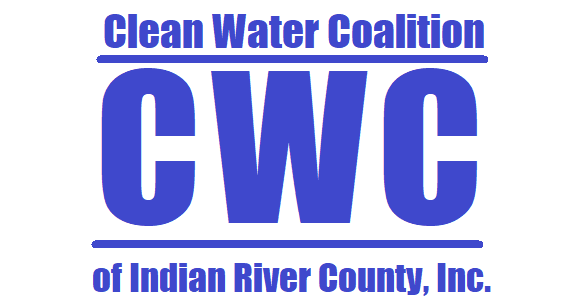 The IRNA is a proud member of the Clean Water Coalition of Indian River County.